The U.S. Navy has announced that, on September 30, it will close down its Project ELF transmitter, according to the Milwaukee Journal Sentinel. The transmitter, which consists of a 56-mile antenna on Michigan’s upper penninsula and a 28-mile antenna in nothern Wisconsin, operates at 72-80 Hz with a peak power in excess of 2 million watts, is used to communicate with submerged submarines. Over the years, it has been the scene of countless protests and the subject of a number of lawsuits. Children with Leukemia, a U.K. charity based in London, is inviting applications for its new £1 million (approx. $1.80 million) research fund. The emphasis is on causes and prevention. The deadline for “outline applications” is October 29, 2004, with full proposals due on February 18, 2005. Winners will be notified on 2 April 2005. An announcement appears in the September 9 issue of Nature. The California Public Utility Commission has decided to take a fresh look at its EMF policies, which were first adopted in 1993. At its August 19 meeting, the CPUC announced that it expects the review to be completed within 18 months. In a related decision, the commission approved a new power line, the Jefferson-Martin line, to meet electricity demands on the San Francisco Peninsula. EMF Decision Time in California: Follow the Health Data or Follow the Money? California will soon decide what's next for EMFs. As power line skirmishes continue to smolder across the country and around the world, California regulators may be the first to take stock of all the new health data that have been generated over the last decade. An advisory committee has recommended that the International Agency for Research on Cancer (IARC) reassess the cancer risks associated with RF radiation. This should be a “high priority,” according to the panel’s report, which was issued last week. The group, with 29 members from 18 countries, suggests that the new evaluation take place between 2022 and 2024. A major review of cell phone cancer risks is at the center of an ongoing controversy over whether it is biased and should be withdrawn. The new paper by some of the most prominent members of the RF–health community contends that epidemiological studies do not show an increased risk of brain tumors or acoustic neuroma associated with the use of mobile phones. That is, cell phones are cancer safe. In a victory for advocates of precaution, an Italian court has ordered the government to launch a campaign to advise the public of the health risks from mobile and cordless phones. The information campaign must begin by July 16. The court in Rome reached its decision last November, but the announcement was only made yesterday. The decision is here. The International Commission on Non-Ionizing Radiation Protection (ICNIRP) has determined that the two recent animal studies pointing to a cancer risk from cell phone radiation are not convincing and should not be used to revise current exposure standards. Martin Blank died on June 13 at the age of 85. 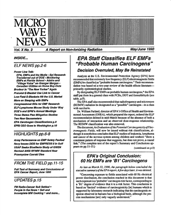 A retired professor at Columbia University, Blank was a long-time EMF researcher, best known for his collaboration with Columbia’s Reba Goodman. Writing in his 2014 book, Overpowered, Blank called himself an “unlikely activist” and urged people to practice precaution. 2. RF radiation has biological effects at levels previously believed to be innocuous —they may be good or bad. An Inordinate Love of Foxes?